Tracc (Tropical research and conservation centre) on Pom Pom Island Semporna, have just rescued 6 humphead wrasse ( also called mauri wrasse, Cheilinus undulatus) from a certain death as the main course for dinner in a live fish restaurant. The volunteers and staff agreed not to drink any beer for a week but to put the same amount of money into a kitty to purchase the folorn looking baby humphead wrasse. TRACC as an organisation agreed to match the volunteers beer fund and together we were able to find enough money to buy all 6 of these endangered fish. 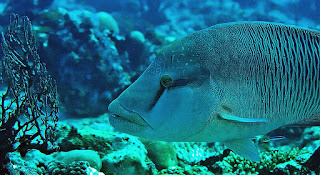 The IUCN endangered species list (the Red list) (Endangered A2bd+3bd ver 3.1) lists humphead wrasse as endangered but TRACC surveys around Semporna and the whole Sabah coast found very, very, very few. Apparently a normal population is around 10 individuals per hectare but in our 370+ hours of surveys on Pom Pom Island and other nearby islands in the Semporna district we found a population of less than 1 individual per sq km. That is a reduction of more than 1000 times - definitely severely endangered. A normal reef should have 10 individuals in a hectare (about the size of a football pitch) but during multiple dives on many different islands and reefs we saw an average of 1 small HHW in each 100 hectares. 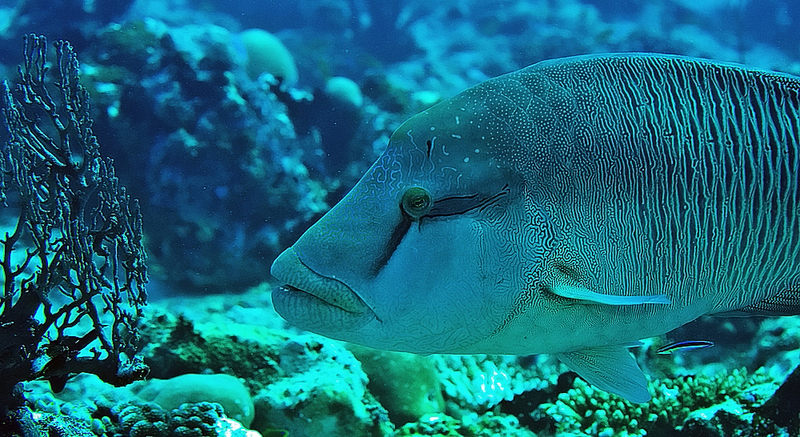 The information we have for Semporna district is scary but it is not unique, ask any diver and the numbers of humphead wrasse on any reef that is not 100% protected and the answer is always zero. In our area at least, the fish are severely endangered if not regionally extinct and definitely need protection. 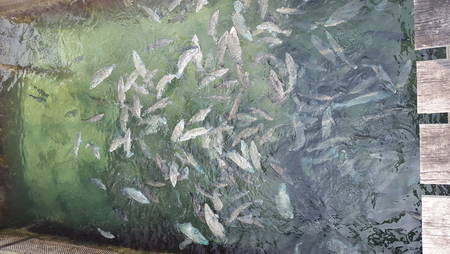 The Juvenile HHW fish were transported to Pom Pom Island in a large dustbin filled with seawater and released onto the reef crest at around sunset. The next few days were a bit harrowing as the divers searched and reported none seen. HOWEVER, I am pleased to report that at about 5 days later we have now seen 2 of the rescued juveniles and they seem to be behaving normally, wandering around the reef and looking for food. Still very shy to hard to approach and get a good picture. Apparently the fish becomes mature at about 6 years, so our juveniles have a long way to go and we hope to see them many times over the next few years. As the voice of the rescued fish I would like to thank TRACC and my fellow volunteers for contributing the cash to rescue these 6 fish.